Fascia is a layer of fibrous, connective tissue that surrounds individual and groups of muscles, blood vessels, nerves, and other structures. It binds some structures together, while permitting others to slide smoothly over each other. Fascia is dense regular connective tissue containing tight bundles of collagen fibers oriented in wavy patterns parallel to the direction of pull, making it a flexible structure. It is able to resist great unidirectional tension forces until the pattern has been straightened out by the pulling forces. What is the Fascial Abrasion Technique®? This techniqes uses tools to mobilize soft tissues withgout causing skin and lymph damage/bruising. 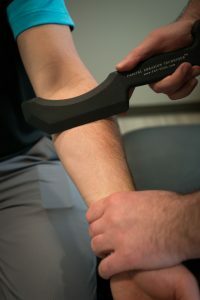 The Fascial Abrasion Technique® Tools (FAT-Tools) is inherinently different from the vast majority of soft tissue mobilization tools available to health care practitioners. Unlike tools such as Graston®, SASTM®, or the Fibroblaster which have smooth treatment surfaces, the FAT-Tools has a patented textured surface that allows for significant tension on fascial tissues without the need for excess pressure. The resulting treatment will allow for results similar to a myofascial treatment called “skin rolling”, but without the treatment soreness that can be associated with this effective fascial treatment modality.